In 1979 Richard Nolle first defined the term “supermoon”, which is now a widely used in our science.According to astrology concept that “a new or full moon which occurs with the moon at or near (within 90 per cent of) its closest approach to Earth in a given orbit ”.if we talked about on the basis of Nolle’s theory, the moon should have to be 226,000 miles away from the Earth then only we can call it ‘super’.December supermoon is also known as a Full Cold Moon in the northern hemisphere because it takes place at the starting season of winter. When is the next Supermoon 2018 ? According to Report of NASA, the next supermoon in 2018 will be at the night of 31st January 2018.
take care you’re as far away from light pollution area if possible. 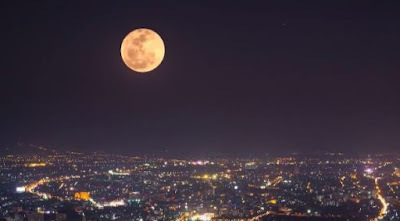 Try to find out an area with open and clear sky then only you will be able to get a better view of “Supermoon” on the nights of 31st January 2018 and also on 1st February 2018 at about 2am,so don’t miss this amazing opportunity. PREVIOUS POST Previous post: Ex-Bigg Boss Contestant Elli Avram is Dating Hardik Pandya ? NEXT POST Next post: Parineeti Chopra has been appointed as a Brand ambassador for the Australian Tourism Board.